A recent article from HBR on HR’s seat at the table—or lack thereof—argues that HR has been underperforming for years. Our own research shows that HR too often lacks the information or insights to be truly strategic. This lack of insight into workforce data may be part of the reason HR still is not a strategic arm of most companies. Our surveys show that only half (52%) of executives say workforce issues drive strategy at the board level, and nearly one-quarter say that workforce issues are an afterthought in business planning. All of the sub-disciplines of HR—recruiting, employee relations, performance management, compensation and benefits, and learning & development—have to work together to figure out what customers (the employees and leaders of the organization) need, educate them on risk, and engage them in the right solutions. HR cannot afford to think in silos, offering ‘products and services’ that simply add work to the already overburdened front-line manager. On Friday we talked about the lack of HR tools and metrics plaguing businesses, which lack ample data about the workforce, quantifiable benchmarking, and the ability to glean insight from the data they do have. HR’s lack of tools may impede progress toward meeting workforce goals (only one-third of respondents say they have made good or significant progress), but the problem also suggests a deeper issue with HR strategy. Our survey found that while companies are executing on operational plans, less than a third have a strategic, enterprise-wide vision for the workforce they want to build. Without a vision, companies are unlikely to acquire the tools they need to meet workforce goals, and they will struggle to use the resources they do have properly. The imbalance between strategy and vision is even more pronounced in certain countries. In both Australia and China, for example, nearly three-quarters say they have a defined execution plan, while just 25% say they have a vision. You can read more about the relationship between strategy and vision in our research report, The Looming Talent Crisis. For even more data, check out our project landing page. Over half (53%) of executives we surveyed say workforce development is a key differentiator for their firm; despite best intentions, most do not have the tools and organization to back it up. In fact, just 38% say they have ample data about the workforce to understand their strengths and potential vulnerabilities from a skills perspective, and 39% say they use quantifiable metrics and benchmarking as part of their workforce development strategy. What’s more, only 42% say they know how to extract meaningful insights from the data available to them. 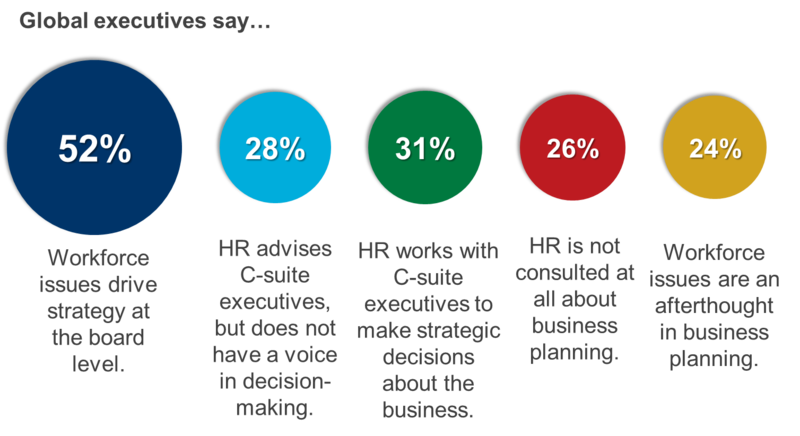 And C-suite executives are more likely than HR executives to say their firm uses quantifiable metrics and benchmarking as part of their workforce development strategy, suggesting further strategic misalignment. The bottom line? Companies are not making progress toward meeting their workforce goals–just one-third say they have made good or significant progress–and the lack of metrics and analytics capabilities could be holding back their progress. The Shifting American Workforce: Growing Legions of Freelancers and Independent Contractors (Inquisitr): Dependence on non-payroll workers is growing quickly. Though labor statistics can’t tell us exactly how many freelancers are in the workforce, we’ll need to have a better sense of these figures soon—especially as increasing reliance on these workers changes HR strategy. Women should ‘man up’ for male-dominated fields (Economic Times): According to researchers from Michigan State University, women who described themselves with masculine traits in an experiment were more likely to be considered fit for a job than those who used traditionally feminine descriptors. New graduates still prefer to work for state-owned firms (South China Morning Post): An annual survey of about 48,000 people conducted by ChinaHR.com shows substantial changes from last year’s results. Among them? This year, many more say they would rather start their own business than be employed by someone else, and salary expectations are rising. Despite changes, new graduates are still quite likely to say state-owned firms are their first choices for employment. Preliminary results of our survey suggest that companies are not strategically planning for the workforce they want to build—furthermore, many of them do not have a vision for what they want that workforce to look like. Without a clear vision and strategy for workforce development, companies are more likely to struggle with issues including skills gaps, contingent employees, and an increasingly diverse workforce. How should firms begin to rethink their talent strategies? Better data about employee skills and quantifiable metrics for assessing performance would help. But the first step may be giving HR a voice in decision-making and keeping talent issues top of mind. The Government Business Council has completed a new study around workforce development and employee skills within the US government. The survey of 1,100 federal leaders found that managers are relying on incomplete information for their workforce planning, and have inadequate data to effectively plan and manage their workforces. We are excited to find out how these survey responses compare with the industries we are surveying—in addition to the public sector, we’re reaching out to executives and employees from banking, insurance, retail, healthcare, professional services, and consumer goods. Are other industries facing similar challenges? You can read GBC’s entire report here, or check out their executive summary below. Yesterday, we attended the Bloomberg Enterprise Technology Summit in New York City. There was a lot of discussion about how technology is influencing HR priorities and outcomes. The former CIO of the CIA, Gus Hunt, said that access to security talent can be a limiting factor for companies migrating to the cloud. Kirsten Wolberg, VP of Technology at PayPal, said using a hot technology was a good way to attract top talent. And employee expectations are changing as well. More and more, employees are asking why they can’t access and use certain apps at work that they can at home. It sounded pretty familiar to us, because our surveys address the ways technology is influenced and constrained by human factors. At the end of May, we will be able to identify some key gaps and suggest solutions to decision-makers looking to address these issues. Stay tuned.